It finally happened. 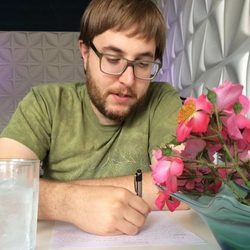 I’ve heard of it from other writers, but I’d never had the experience myself before now. Not only that, but I was writing them. It was an odd, but thrilling experience. Scientists have linked these sleep spindles to areas of the brain that have been used during the day. So if you do a task for a prolonged period of the day like sewing, teaching a class, shooting hoops, mindless factory work, or writing then your brain “practices” this activity at night in your sleep, giving you sleep spindles in the exact same area of the brain. Those who sleep talk are oftentimes acting out their sleep spindles. My wife, for example, is a frequent sleep-talker. She is almost always teaching, admonishing kids to quit goofing around, or gabbing with other educators in her sleep. I imagine that since I’ve been writing even more each day than last year, that my brain has been spending ample time exercising my writing muscles while I sleep. Here’s the thing about sleep spindles and your sleep talking dreams: you shouldn’t be able to remember them. It’s only your rapid eye movement (REM sleep) that you remember. These are typically the more exciting dreams where you’re trying to find something, accomplish a task, get somewhere, are maybe flying, or (if it’s a nightmare) trying to get away from something. In fact, when we talk about dreams and dreaming, we’re almost always talking about REM sleep. So, while I’ve been brain spindling it up with an increase of 2 to 3 more hours a day at the writing desk this year, it’s still surprising to see my characters come to life in my dreams. While it’s most likely that I was in REM sleep, just the manner of my dream makes me wonder if I hadn’t somehow managed to remember a sleep spindle dream. If I did, then my writing sleep spindles look pretty cool. I won’t give every detail, but here’s the gist of the dream: I was dreaming about two of my characters—the two which are the principle characters of the current chapter I’m writing. Jazzy and Miles were at a white wrought-iron table in an outdoor cafe, and Jazzy was being offered alcohol. I wasn’t in the dream, but I could hear myself narrating what was happening in exactly the same manner that I hear myself think when I write. The scene had to do with whether Jazzy would accept the alcoholic drink or not due to her Christian beliefs which don’t forbid alcohol but do frown on it in practice. Then my dream switched to a scene with Maha and a more minor character. It’s a parallel scenario with Maha at a wooden table in at a bar and restaurant in the heart of Delhi. In this scene, Maha is having the same issue, except her Islamic beliefs don’t allow her to drink alcohol at all. I again hear my voice narrating the scene and the actions. Like with Jazzy, I can see my character fully, both from a distance and up close. Her face is troubled because she’s in a delicate situation of appearing rude if she doesn’t accept the drink but will be sinning if she does. Then, suddenly, a line comes to mind that has to do with Miles back at the previous scene. The dream jumps over to Jazzy and Miles who are sitting at the same outdoor table. This one beautiful line flows out of me so intensely that I see it being written in my handwriting at the bottom of the scene below their table. I don’t see my hand, I just see the words appearing in my unique chicken scratch. After this, the dream goes immediately back to Maha’s dilemma, and I wake up right before I’m about to narrate what she decides to do. Note: neither of these exact scenes appear in my book, but the characters I envisioned do exist in my mind. What was so cool was that they appeared exactly as I picture them. In fact, they seemed even more vivid and lifelike in my dream than they do when I’m writing their story. They looked much more human. The sweat on their brows, the pores on their faces were all clear when the dream was examining them closely. It was a crazy positive experience that tells me I’m doing something right. And that thing is writing. If I’m writing enough in the day that I spend time writing in my sleep, this means I’m really giving myself over to the thing that I want to do with my life, which is bring a book into existence through words in my mind being transferred onto a page. Let me know if you’ve ever dreamed about your characters in the comments below. I also want to make it clear that sleep spindles appear to do more than help us learn. We’re actually still learning about them. Sleep has always fascinated me, and I think sleep spindles and the unconscious processes of learning are some of the most amazing aspects of unconsciousness—even more interesting than REM sleep. What I’ve written above is what I remember about sleep spindles. So do your own research to see what’s new and what other studies might have to say in agreement or opposition to sleep spindle learning.